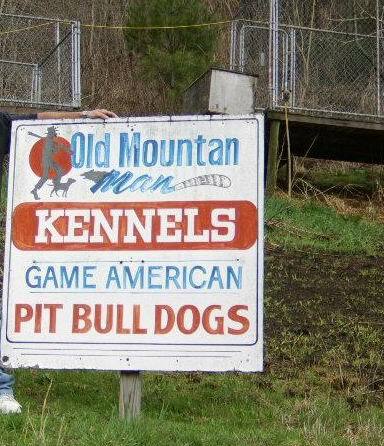 Stonewall`s parents was GR CH Snake and CH Missy half brother and half sister whose mother was Honeybunch. In the 80’s of last century, a puppy namedTravis (in the future Stonewall) lived and was brought up by Tom Garner (breeder of Stonewall). Travis was first sold to a lady named Mary Parsons. Then Mr. Hunter won with Stonewall two games vs DEETER `S PEE WEE 2W for 42 minutes and CHICKEN DAVE `S MITE for 45 minutes. However, in the fight history Stonewall is mostly known as an excellent producer. 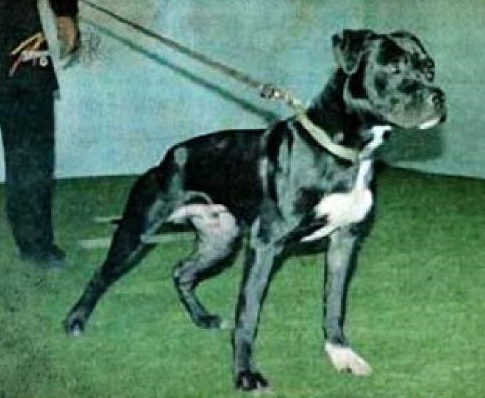 Stonewall started mating at age 6 years and he did few litters, but nevertheless he have titles of R.O.M. (unreported) and P.O.R. His children also get these titles, and grandchildren and great-grandchildren are still alive and continue to add points to their parents. 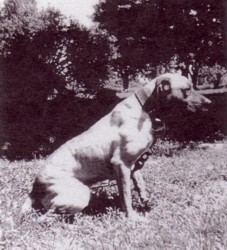 Frank Rocca got the Stonewall as adult dog. Rocca considering Stonewall as the best producer of game dogs who had ever lived in his yard. 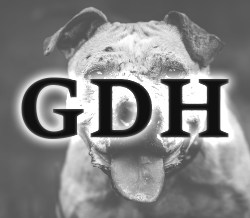 “”Q: ONE OF YOUR TOP STUD DOGS IS “ROCCA’S STONEWALL”, WHAT ATTRACTED YOU TO HIM, WAS IT THE BREEDING (HONEYBUNCH) OR WAS IT THE DOG AS AN INDIVIDUAL AND HOW WOULD YOU RATE HIM IN COMPARISON TO OTHER STUDS YOU HAVE OWNED? because he’s far superior in terms of being a producer, and as good as the best performers I have had. His pedigree is second to none. The sad part is he’s eleven years old and his days are limited. Thanks to F. Rocca Stonewall line dogs become famous all over the world, in fact, he (Rocca) is the founder of Stonewall line. 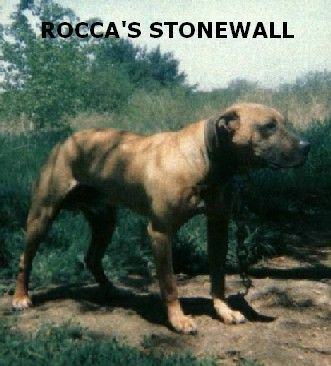 Rocca sent Stonewalls descendants in Europe, and has initiated Stonewall / Red Boy cross, which gave to world many outstanding champions and producers. For example, the Stonewall`s daughter Daphney 2W R.O.M. from his nephew CH Leroy R.O.M. (50% Stonewall) gave birth to 4 Champions at one litter.